The space automatic interplanetary station “New Horizons” of NASA aerospace agency on the first day of the new year is going to fly past one of the most distant space objects of the Solar system. From the moment of his unforgettable meeting with Pluto in 2015, the probe flew away from the house even further and headed for the trans-Neptunian asteroid from the Kuiper belt – Ultima Thule (“Ultima Thule” or 2014 MU69). The object is located approximately 6.6 billion kilometers from Earth. It was discovered in 2014, when the probe team selected a new target for research. In other words, we know very much about this object, but very soon the “New Horizons” will change this. At the moment, scientists know that the length of the asteroid is about 30 kilometers – less than two percent of the diameter of Pluto. “It’s very difficult to get to him. Much harder than before Pluto. Instead of an object the size of the continental US, we fly to an object the size of Boston. It is not only 100 times smaller, but also 10,000 dimmer than our previous goal, ”says project head Alan Stern. In addition, if we also take into account that after Pluto, scientists had only four years to accurately calculate the trajectory of movement 2014 MU69 – the complexity of the task increased several times. 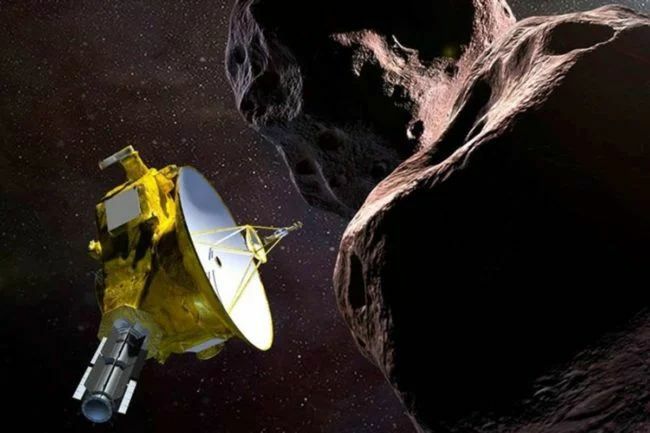 If they do not fail the calculations and everything passes as planned, the New Horizons probe will fly past the asteroid’s surface at a distance of 3,500 kilometers at a speed of more than 14 kilometers per second. At such a speed of the probe, as well as the distance and size of the object, the complexity of photographing it will be similar to trying to take a picture of a mosquito flying next to it. And this is if you still do not take into account a very small amount of sunlight around – the external borders of our system are real darkness. The difficulties do not end there. It should be understood that the radioisotope thermoelectric generator (RTG), on the basis of which the probe operates, has degraded for 13 years since the launch of the device, so the mission team needs to be very careful in terms of the choice of which scientific tools to use to study the asteroid. In its current state, the battery of the New Horizons is capable of supplying power to systems that are equivalent in terms of electricity consumption to three ordinary household light bulbs, Stern says. The mission team is now actively seeking space dust and other small bodies in the asteroid area, which may be located near Ultima Thule. And this is done not for the sake of scientific discovery, but because all these objects can pose a very great danger to the spacecraft. “If an asteroid has a cluster of orbital debris, any body the size of an ordinary grain of rice at such a speed will tear the New Horizons to shreds. If we do not receive any signals from the vehicle on the day of the flight past the asteroid, then most likely it will mean just such a sad development of events, ”explains Stern. But if everything goes well, the probe will send the first scientific space data of 2019 to Earth. And they, most likely, will contain information on the composition of MU69 and its temperature. All this can be discussed in our Telegram-chat, if you, of course, can break away from the New Year’s table. Select the best shots of the object will be very difficult. Flying past the asteroid, the probe “New Horizons” will make a series of high-quality photographs. Scientists hope to get even better pictures compared to photos of Pluto, because the device will be more than three times closer to the subject than the last time. However, if the calculations of the trajectory of the Ultima Thule motion turn out to be erroneous even a little bit, then we run the risk of generally being left without photos of the asteroid and instead we see only empty space. With the help of “New Horizons”, scientists also hope to find out for certain whether the Ultima Thule is one object of a strange shape (similar to an unfinished snowman), or whether it is two objects with a very close orbit around each other. It does not exclude the possibility that MU69 in general is a whole cluster of more compact bodies held by common gravity. Ultimately, researchers expect Ultima Thule to help them better understand the early history of our solar system and its planets. According to astronomers, similar objects, like this asteroid, appeared in our system long before it formed our Earth and other planets. And since the object is very far from the Sun and is a very small celestial body, not subject to geological activity, then we may have one of the most ancient planetary building blocks that we can see firsthand.